Yesterdays Fall Rodeo & Concert held at the SLRC Rodeo Grounds at Equus was a lot of fun. 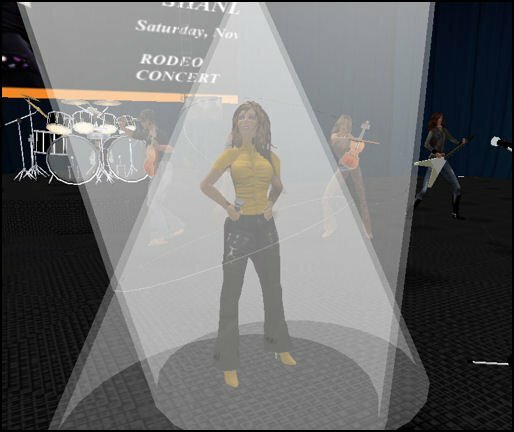 Special guest, Shania Twain, had the crowd on their feet dancing and twirling in their fun cowboy and cowgirl attire. Although this was not a live concert, it is music related so I felt it was worthy to post. Wundur and I entered the bull riding contest. Wunder had an impressive score that landed him in 2nd place! Thanks to his encouragement, I was a last minute entry and took a respectable 4th out of the 20 or so contestants! Woot! We saddled up and rode the trails around the various SIMs which seemed never-ending. The SIMs are beautiful and a great place to ride! Wunder is on his beautiful black Fresian Stallion and I am on RockStar, my loyal and beautiful Appaloosa mare. You were awesome Duchess and looked great!! Thanks for coming and supporting everyone who made this sim and day possible!